The Senate has asked the Independent National Electoral Commission(INEC) to release result of the June 12, 1993 presidential election result which late Moshood Kashimawo Olawale Abiola was presumed winner. The upper chamber also called for all allowances and entitlements be made available to the family of late Abiola and his running mate in that election, Amb. Babagana Kingibe. President Muhammadu Buhari had on Wednesday directed that effective from 2019, Nigerian Democracy Day, marked every May 29 for the past 18 years should be shifted to June 12. These resolutions were sequel to a Point-of-Order raised by Sen. Olanrewaju Tejuoso (APC-Ogun) at plenary. He said that recognition of June 12 as Nigeria’s Democracy Day was a remarkable event in the country’s history. “I believe President Muhammadu Buhari needs further encouragement to continue this reconciliation that he started. “There are so many reconciliations that we need, like reconciliation between the Executive and the Legislature. “We need to encourage the President-what he has started took us 25 years to achieve. 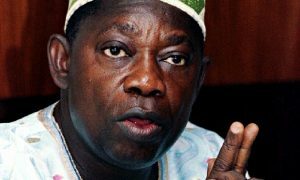 Contributing, Sen. Biodun Olujimi (PDP-Ekiti) said the late Abiola had done well especially for those of the Southwest Nigeria. “This is one time that a President had given to what MKO Abiola and his family went through to fight for this democracy that we today encourage. “I salute the president’s courage and I thank my colleague for bringing it to the fore. Olujimi who noted that the result of that election was never announced said this was the time for the result to be properly announced by the Independent National Electoral Commission (INEC). “This is because government is a continuum; MKO declare should be declared president. “If and when that is done, there has to be reparation of all his entitlements,” she said. Also speaking, Leader of the Senate, Sen. Ahmad Lawan said President Buhari had shown clearly that he was a democrat. Similarly, Deputy Senate President Mr Ike Ekweremadu said the recognition was “a good day” for Nigeria. “We must commend the President because finally, we are beginning to address injustice in the country. “Our prayer is that this must be sustained. We must address the injustices all over the country. “Those who are complaining about environmental degradation, marginalisation, killings or any kind of injustice. “This is time to address them,” he said. He added that any country that allowed this was heading to a major crisis. “The provisions of Section 135 of the Constitution on the tenure of the President. “If we now say that June 12 is now democracy day, presupposing that in 2019, the President will be sworn in June. “This is legally impossible because the law says subject to the provision of this Constitution, a person shall hold the Office of the President until when the successor in office takes his oath of office. “The implication therefore is that May 29 remains the day the President will be inaugurated and he takes his oath of office. “If we are moving from May 29 to June 12, it means we are to amend this Constitution otherwise we will be extending the tenure of a President beyond what the Constitution stipulates. “We have to advise the President properly,” he said.